Confession time. I had never read a single Ray Bradbury book before this week. For those of you who are fans of this famous author, feel free to judge me. I am judging myself. The crazy thing is, I actually met Ray Bradbury ages ago via a mutual friend. I remember walking through a book store to pick up a paperback before the meeting and grabbing the first title that grabbed my attention with hopes he would sign my copy. Specifically, I purchased Dandelion Wine. Last week I rediscover the book on my shelf and found an old, yellowing boarding card indicating I would read the book on one of my cross-country flights. (Note the maiden name and white "shadow" where it had been stuck!)Mr. 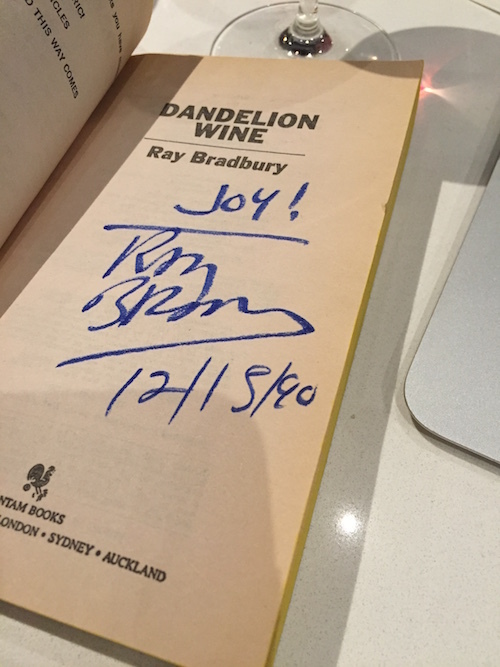 Bradbury signed the front page so I should have at least read the book!And yet, Dandelion Wine has sat on a shelf, unopened for 26 years. Now, having finished the novel, I see how much I missed having this tale in my head. The story is simply lovely. Dandelion Wine tells the story of an eventful summer in the life of a 12-year-old boy, Douglas Spaulding. The year is 1928, but the themes of life and loss, of discovery and pain still ring true. In this particular summer, Douglas realizes he’s alive; really, truly alive. As you might imagine, when a boy discovers he’s alive, every moment takes on a new sense of urgency and meaning. Douglas’ world in rural Illinois is described by Ray Bradbury with depth and detail which I found utterly delicious. Clearly Bradbury pulls from his childhood experiences and uses his considerable memory and descriptive skills to paint scenes which you can practically see. His characters leap off the page. I love the line, "he ran laughing." Isn't that exactly what 12-year-old boys do? Time and again the book celebrates ordinary life in all of its glory. Whether it’s a Grandma making dinner, a visit to the ice cream counter, or pulling weeds, the beauty of simple is evident. Overall the book reads like a poem and, as such, it’s not a speedy read with a quick moving plot; it’s something you want to absorb. Think of a sultry summer day in a hammock and you’re closer to how the book flows. In fact, summer is a character in the book, providing more than a setting and actually imparting a flavor. The characters in Green Town come and go abruptly in the story, but the theme of seasons, friendship, and respect are part of every narrative. Though it’s taken me close to forever to pick up Bradbury, I’m glad I’ve finally discovered him and that my gateway was this little treasure.